It was early morning and I awoke from a dark, swirling dream of half-formed figures and terrifying sounds. I awoke to a shrieking in the real world, a horrible, shrill sound that split the quiet of the pre-dawn morning. My neighbor heard it – he was out getting the paper, I think – and was knocking on my door, asking if everything was all right. I told him it was the tea kettle, but I could tell he didn’t believe me. It didn’t sound anything like a tea kettle, but what else could I say? Once I got rid of him I ran down to the basement where the shriek came from; I saw the camera first – it was smashed, in several pieces. It looked like it was stepped on somehow, but by what I have no idea. The rat trap was sprung and there was that horrible smelling green slime all over the place, there were boxes knocked over – something had happened, clearly, but I wasn’t sure what. I wasn’t sure I wanted to know – I’m still not. Things have been quiet, mostly – calm before the storm, perhaps. I think it tries to convince me that I’m crazy, that I’m losing my mind – enough days without an… incident, and I start to think maybe it’s all in my head, maybe I’m making it all up. I know it isn’t true, though – I know it’s all there. I have the pictures, and the videos, and this blog… it catalogs everything, that’s why I do it. There are things here, in the blog, that I don’t really remember now -that is troubling, that I wrote things, took video of things and don’t remember them. So much has happened though – it’s easy to understand why my memory would be a little off in places, right? Something did happen, in the basement. There was a shrieking, like a terrible shrieking sound early in the morning. My neighbor heard it, came to knock on my door to see what was wrong – see, it isn’t just me. I had to lie, I told him it was my old tea-kettle, but he wasn’t convinced – he was looking around my house, I could see his eyes, his judgement. We used to be friends, Dave and I. He always used to borrow my long ladder when he was putting up his Christmas lights. He doesn’t look at me the same way now, though – not since it all started. I can see it in his eyes, the fear of me. He probably thinks it’s drugs – isn’t that what they always think? Once he was gone I raced to the basement, but whatever happened was long over. The big trap was sprung, but not damaged. The trap cam on the other hand – that was damaged pretty heavily, it looks like maybe someone stepped on it? And there was more of that green slime around the place. I’m trying to recover the memory card from the camera now, but it’s jammed in there. I’ll post whatever I find once I get it out, assuming the chip isn’t damaged and the video data is still intact. The nights are getting longer, darkness encroaching into the realm of day, and I feel things in the shadows growing stronger. I hear them whisper, hear the discordant piping. It’s hard to keep my thoughts in order, things get so jumbled. I found myself walking today, around College Hill.. I’m not sure how I got there, to be honest. As I said – things get jumbled, confused. I was walking and I know it was hot – a hot, humid day in the city, my skin clammy with sweat and prickling from the heat. There was almost no breeze, I remember that. 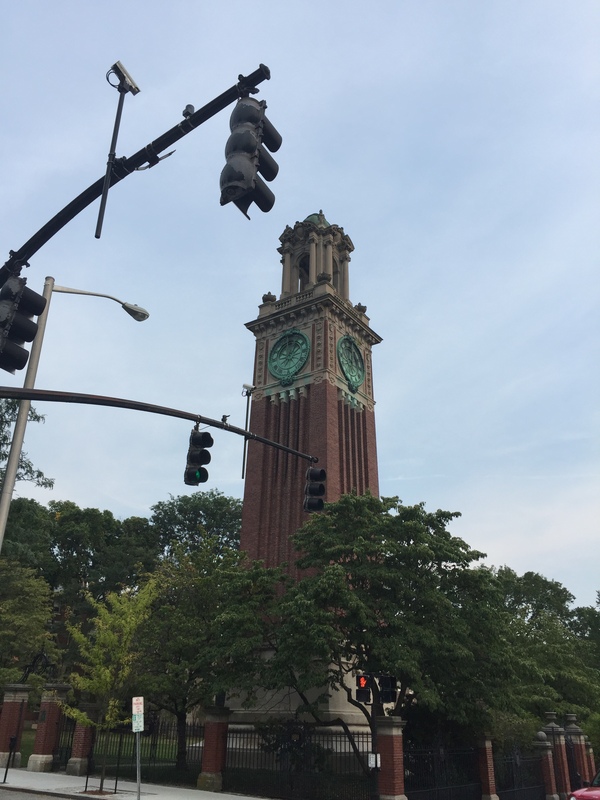 I suddenly found myself in a deep shadow and stared up to see a huge brick tower, one of the great landmarks of Brown University. I stood there, in that shadow. I felt beads of sweat condense and roll down my back, icy cold in the heat. I just stood there, I don’t know how long I stood there, but at some point… I made it home just before dark, drenched in sweat and so thirsty I drank right from the faucet until I was lightheaded. I know there are missing hours – like I said, I get confused sometimes, my thoughts get jumbled.